In recent years, agriculture has gone from obscurity to having a central spot on the G8 agenda. For those working in rural development, this revival of international attention is very welcome, as is the recognition of an increased role for private sector investment. sub-Saharan Africa, about 80 per cent of farmland belongs to, or is cultivated by, smallholders. Around two billion people depend on these farms for their livelihood. Smallholders invest not only their own money, but also their time and labour in their farms. Therefore, it is fair to say that they are the primary on-farm investors in agriculture in developing countries. New investments in agriculture must be sensitive to the requirements of smallholders if they are to achieve the desired result of improving global food security and reducing poverty. The power of smallholdersInvesting in agriculture in developing countries is the single most effective method of improving food security for the world’s poorest people, while also stimulating economic growth. Growth generated by agriculture is at least twice as effective in reducing poverty as growth in other sectors. Experience repeatedly shows – in countries such as Burkina Faso, China, Ghana, India, Thailand, Vietnam and elsewhere – that smallholders can lead agricultural growth. Successful small farms can transform destitute rural landscapes into vibrant economies, resulting in local demand for locally produced goods and services that also spur non-farm employment in services, agro-processing and small-scale manufacturing. This demand, in turn, leads to a dynamic flow of economic benefits between rural and urban areas so that countries have balanced and sustained growth. There are sound economic reasons for supporting smallholder farming. Farming production systems have few economies of scale. Small farms are often more productive, per hectare, than large farms when agro-ecological conditions and access to technology are comparable. In India, for example, smallholders contribute more than 50 per cent of total farm output, even though they cultivate only 44 per cent of the land. mechanised or have high costs involved in managing the workforce. and, with incomes of less than $1.25 per day, they cannot afford to buy much. career opportunities and a potential pathway out of poverty and hunger. 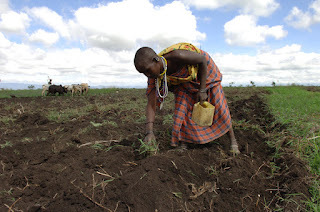 When one talks about farmers in developing countries, one is often talking about women. On average, women make up 43 per cent of the agricultural labour force in developing countries. In East and Southeast Asia and in sub-Saharan Africa, this figure rises to almost 50 per cent. In investing in rural areas, the capacity of women farmers to invest more effectively and with less risk must be supported, given that women in rural societies face greater constraints. Rural women usually have more limited land tenure, less access to credit and equipment, and fewer market opportunities than have men. New investments must also be sustainable – economically, environmentally and socially – so that the benefits last, through the years and the generations. Anyone who has travelled into the rural areas of developing countries will have seen the aftermath of unsustainable development: broken tractors abandoned in fields, withered and untended trees, forsaken hillside terraces. This is the residue of development efforts that did not respect and respond to local conditions, whether cultural or environmental, and that did not work with the local community from the start. remarkable short-term gains, but came at a cost to the environment and to local species. in order for the land to be able to provide for future generations of farmers. without risk to the environment, since farmers in sub-Saharan Africa use, on average, less than 13kg of fertiliser per hectare. This compares with 73kg in the Middle East and North Africa, and 190kg in East Asia and the Pacific. There is also a critical need to develop national and regional markets, to ensure that productivity gains from new investments have the intended economic impact on developing-country economies. Similarly, there is an urgent need to invest in basic rural infrastructure. Today, about 30 per cent of the food produced is wasted, largely as a result of the absence of such basic necessities as markets, warehouses and paved roads. At IFAD, we see time and time again the transformation that occurs when development is sustainable and when local people are involved from the start. Last year, I visited Zongbega, a village in a drought-prone region of Burkina Faso, where smallholders are using simple water-harvesting techniques such as planting pits and permeable rock dams, along with crop-livestock integration. As a result, they have restored land that was once degraded and have increased their productivity. In Niger, a water-harvesting project in the Illela department is still going, more than 15 years after the funding ended – a fine example of the benefits of community-driven development. world leaders meet for the G8 in May and the G20 and the United Nations Conference on Sustainable Development in Rio in June, there is an unprecedented opportunity to solidify the role of public-private partnerships in support of agriculture. I hope their deliberations will take into account the biggest on-farm agriculture investors in developing countries: smallholder farmers.